We've been lucky with the rain, but when the heat comes, it means we're back to hiding inside during the hottest part of the day. 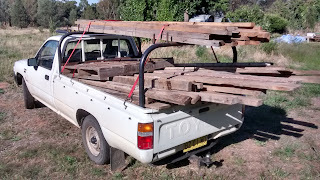 So, while I'm inside keeping cool, I thought I'd share with you a few photos of our latest adventures. Our first clearing sale of the year was a few days ago, and this was the bargain of the day, in our opinion! Would you believe that we got all this for just $5? 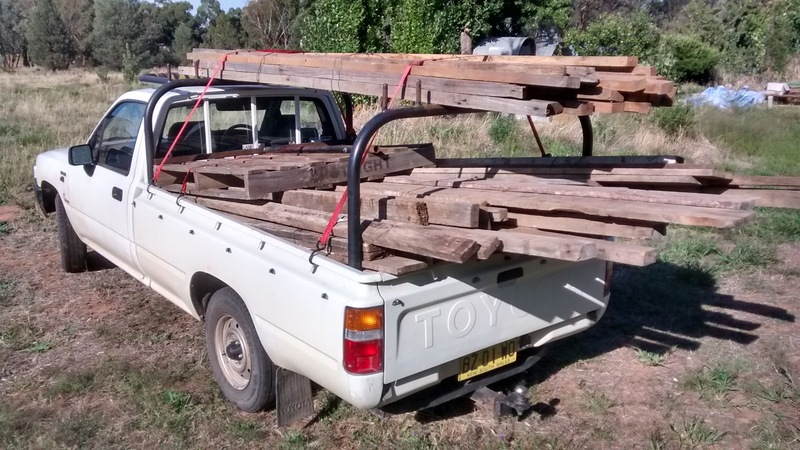 Thank goodness for the ute! Friends of ours had recently lost one of their pair of chooks one frightfully hot day, and not wishing to leave this one lonley, they donated her back to our place (they'd been here before as pullets, so it wasn't too big of a shock for her). She's having a great time under the fig trees. 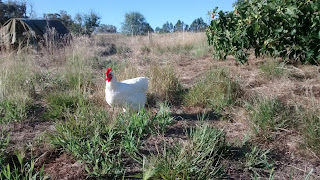 She asserted her dominance over the naked neck chooks, but the dorkings were another matter! So she fit perfectly in the middle of the flock right away. Big surprise! 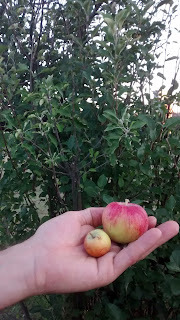 Yesterday we discovered that one of the ancient fruit trees in the orchard is an apple, and it managed a couple of small fruits to prove it. It must have been a surprise to the birds as well, because neither of them were eaten at all. (The birds have plenty of food on the fig and peach trees at the moment.) 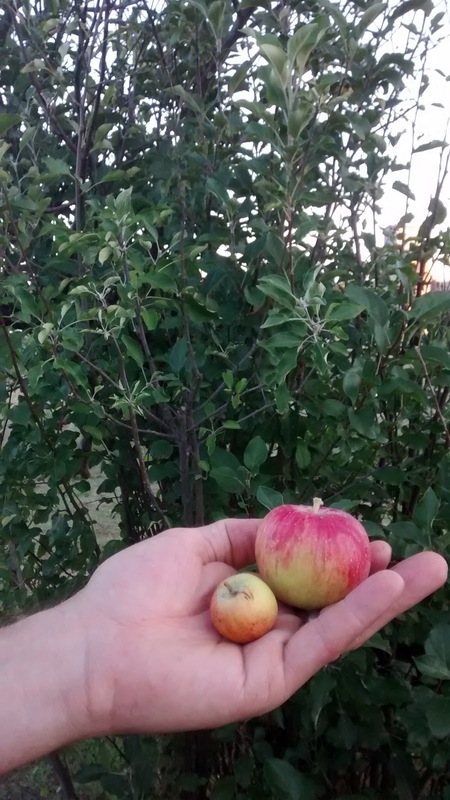 We saved the seeds, and one day I'll graft some of the branches and make more. It's a very tough, and very old tree.. worth saving I reckon! The grapes that were pruned last winter by the permie group grew like crazy this year. They're ancient too, mostly only surviving where they've popped-up near the old grape vines' trunks. This one fruited, much to our surprise, and the grapes are lovely. 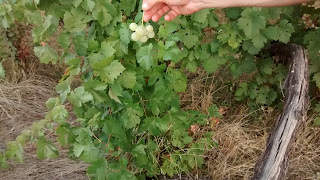 Much like a Menindee seedless, but with seeds - which isn't bad, it just takes a little longer to eat and savour each one - which we certainly did! Other than that, we've spent time learning some wood working, cleaning the pub of course, and I turned another year older. As usual at this time of year, I'm really looking forward to the weather cooling down, to growing more of our own food, and we've got a million projects on the go (and trying not to feel guilty about not doing any of them right now, ha!). Oh, I almost forgot to mention the slithery surprises that come with summer here. We've seen a few snakes this year, but most surprising was the one that was on the back step as I opened the door to get something outside. I think it took me a single second to see it, work out what it was exactly, drool on the floor and make a "Yip!" sound before closing the door again. I waited inside until it was time to get Marty from his job at the post office, and there was much caution and stomping as I walked. We don't harm the snakes here, but it is another reason to look forward to cooler days! Slithery ones in the garden or chook pen are fair game as far as we are concerned, but in the paddock, that is all theirs. Glad for you that the encounter wasn't any closer.